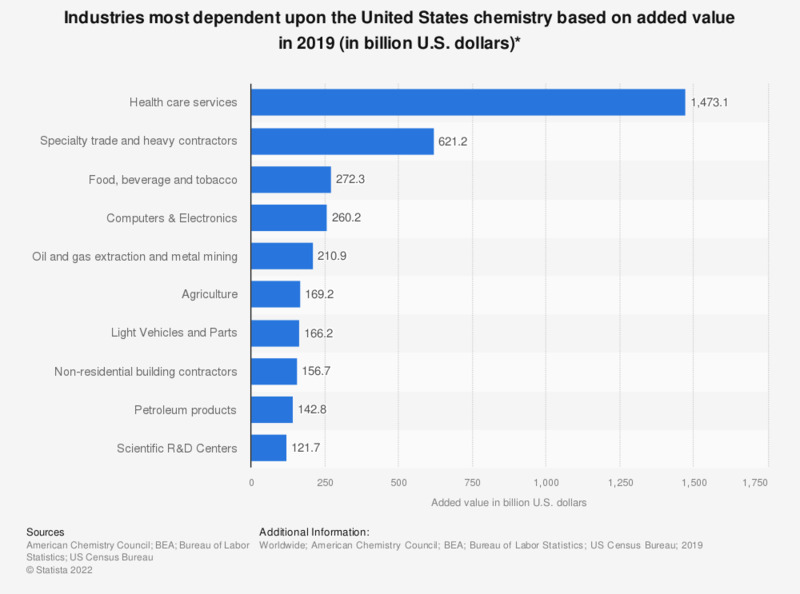 This statistic shows industries which are most dependent upon the U.S. chemistry industry in 2017, ranked by added value. In that year, approximately 173.4 billion U.S. dollars of value were added in the agricultural industry. Intermediate Goods includes Agriculture, oil and gas extraction and metal mining, petroleum products, rubber and plastic products. Consumer and other final products includes food, beverage and tobacco and book and periodical publishing and software. Construction includes nonresidential building contractors and specialty trade contractors. Services include health care services and personal and laundry services.